One of the major hurdles limiting IPv6 adoption is the existence of poorly managed experimental IPv6 sites that negatively affect the perceived quality of the IPv6 Internet. To assist network operators in improving IPv6 networks, we are exploring methods to identify wide-area IPv6 network problems. Our approach makes use of parallel IPv4 and IPv6 connectivity to dual-stacked nodes. 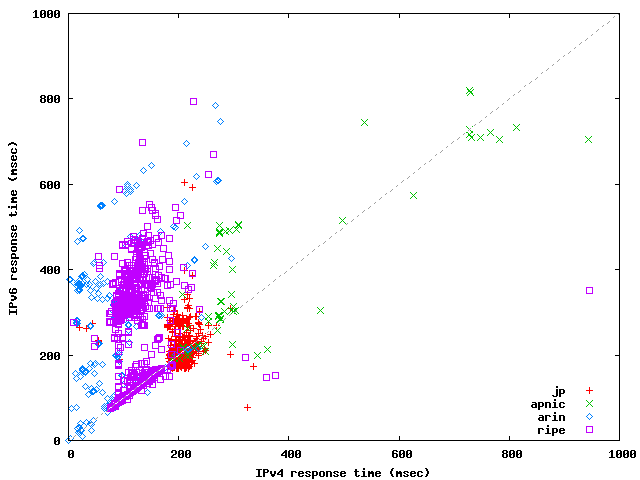 We identify the existence of an IPv6 path problem by comparing IPv6 delay measurements to IPv4 delay measurements. 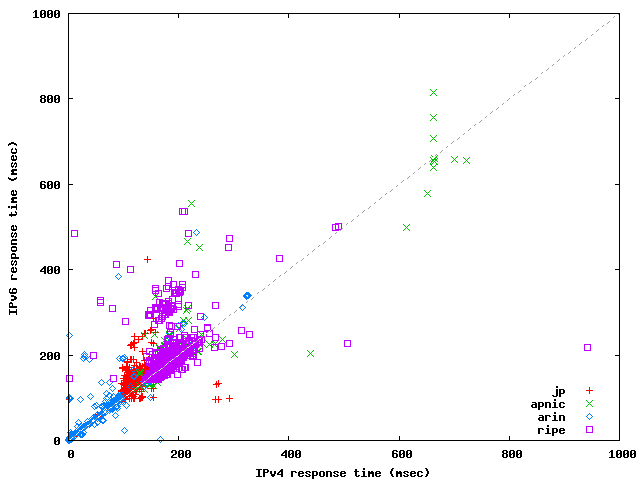 Our test results indicate that the majority of IPv6 paths have delay characteristics comparable to those of IPv4, although a small number of paths exhibit a much larger delay with IPv6. Thus, we hope to improve the quality of the IPv6 Internet by identifying the worst set of problems. Our methodology is simple. We create a list of systems with IPv6 and IPv4 addresses in actual use by monitoring DNS messages. We then measure delay to each address in order to select a few systems per site based on their IPv6:IPv4 response-time ratios. Finally, we run traceroute with Path MTU discovery to the selected systems and then visualize the results for comparative path analysis. Our methodology is simple. First, by monitoring DNS messages, we create a list of systems with IPv6 and IPv4 addresses in actual use. Second, we measure delay with ping to each address in order to select a few nodes per site based on the IPv6:IPv4 round-trip time (RTT) ratios. Finally, we run traceroute with Path MTU (PMTU) discovery to the selected sites, and visualize the results for comparative path analysis. Data was collected by measurement from three locations in June, 2004. The three locations are 1) WIDE, a research network in Tokyo, Japan; 2) IIJ, an ISP providing commercial IPv6 services in Tokyo, Japan; and 3) Consulintel, in Madrid, Spain, directly connected to MAD6IX that is part of Euro6IX. Our dual-stack ping is a script that obtains the IPv4 and IPv6 RTT delays for a set of target nodes by running ping and ping6. From the dual-stack ping results, we can identify the percentage of dual-stack nodes reachable only by IPv4 even though they have AAAA records. 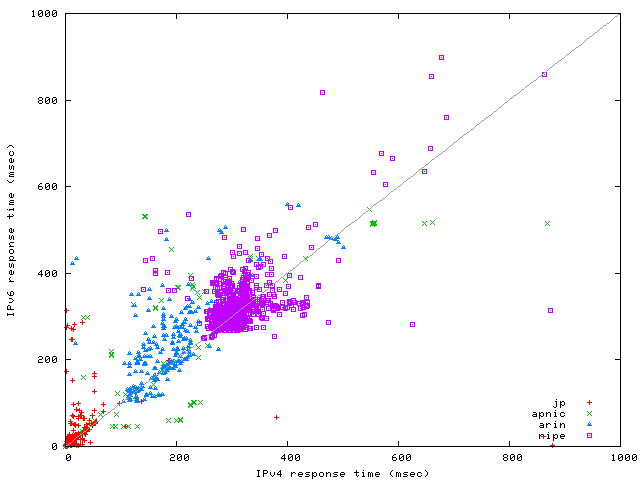 The following figures show the scatter graphs of the observed RTTs. We plot a node's IPv4 RTT on the X-axis and its IPv6 RTT on the Y-axis. 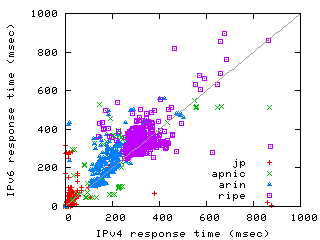 Each graph plots about 2,700 nodes that were reachable by both IPv4 and IPv6. 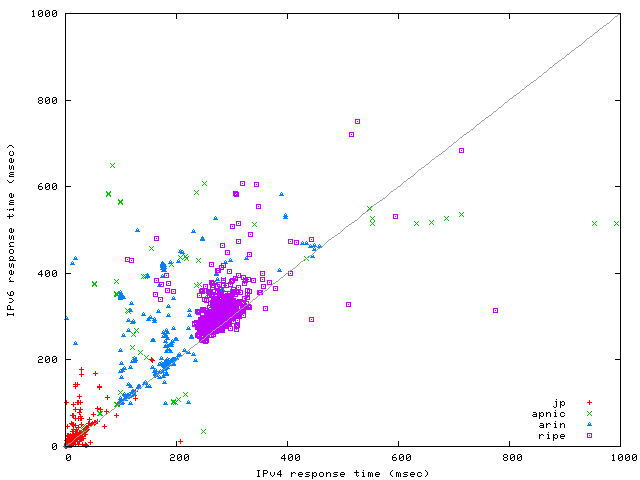 When the response time of IPv6 is equal to that of IPv4, we plot the node on the unity line, y = x. 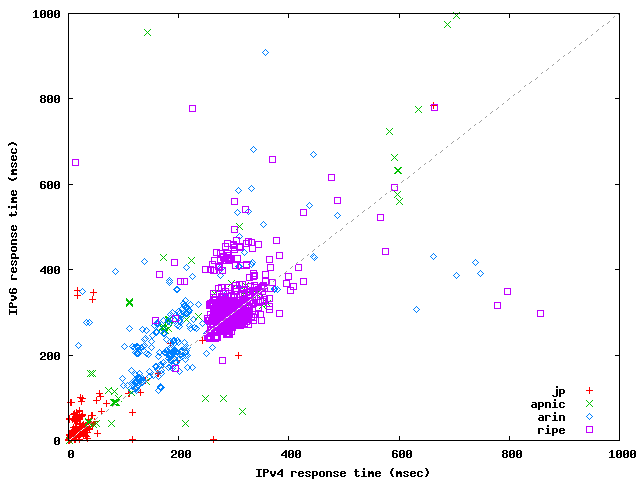 For nodes above this line, IPv4 outperforms IPv6, and for nodes below this line, IPv6 outperforms IPv4. We again categorize the nodes into four regions. These results indicate that the majority of the nodes have similar RTT for both IPv4 and IPv6. 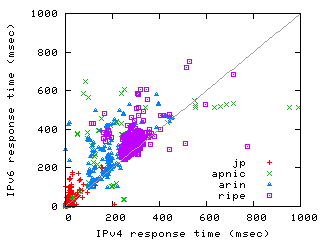 A number of individual nodes far above the unity line have IPv6 performance issues specific to the node or the site. The clusters above the unity line indicate the existence of roundabout paths within the backbone network. Compared to WIDE, IIJ has fewer nodes below the unity line, probably due to Acceptable Use Policies (AUPs) of academic IPv6 networks. The Consulintel site has a large cluster of RIPE nodes below the unity line, likely connected through Euro6IX. 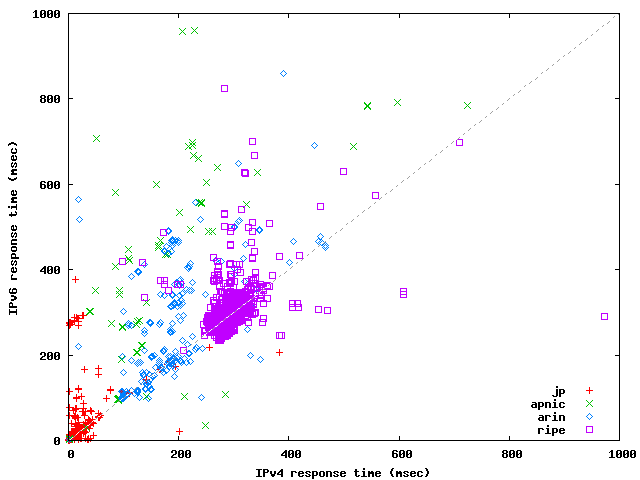 The majority of nodes are around the unity line; the percentage of nodes whose IPv6:IPv4 RTT ratio is less than 1.25 is 80.1% for WIDE, 74.3% for IIJ, and 82.5% for Consulintel. 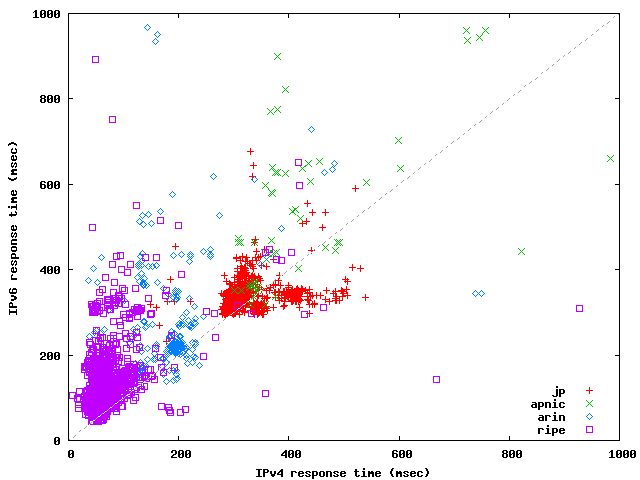 APNIC nodes have large variance in RTT ratios due to its topological diversity; many APNIC countries are connected to Japan through the US or Europe, and many satellite links connect islands. Also, some networks are funded to promote IPv6, such that there are nodes with a direct IPv6 path but with an IPv4 path that must go through the US. We ran scamper to the representative nodes with PMTU discovery from multiple locations. In the following links, we have created graphs to visualize a macro-level view of Path MTU obtained from the scamper output. To visualize the results for comparative analysis, a set of scripts divide the scamper output into smaller target groups and create a graph for each group. Each graph contains 10 target nodes, yielding about 130 graphs for each measurement; the script also creates a web page for each graph along with scrollable scamper text output. 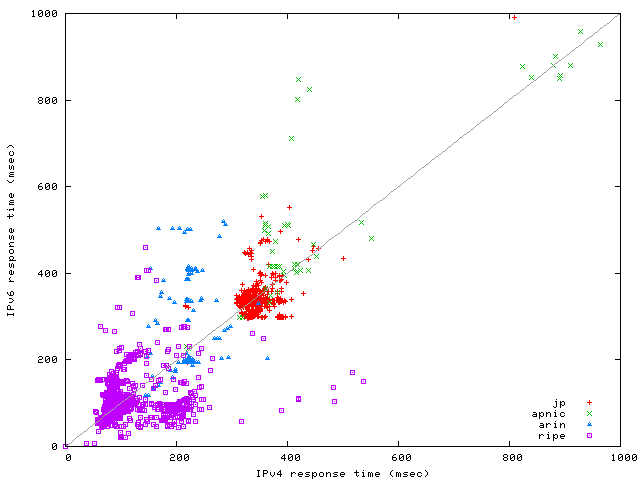 In the graph we map IP addresses into Autonomous System (AS) numbers to simplify the presentation. 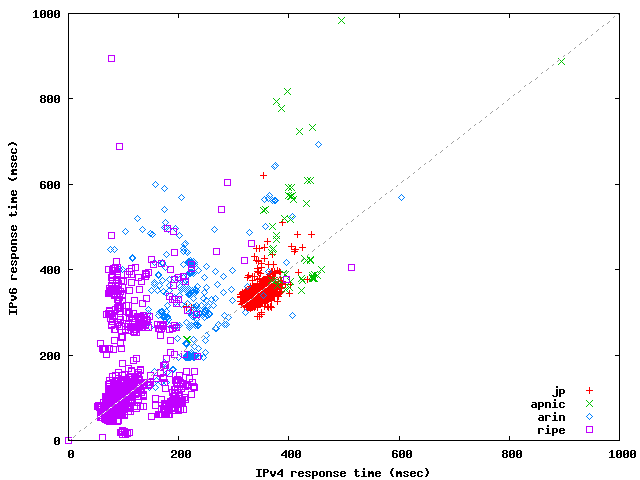 The following links show the results of the dual-stack traceroute and its visualization. Each measurement result contains about 130 graphs. 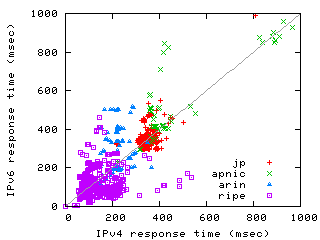 For each target node in the graph, two lines are drawn from the source to the destination, the upper line for IPv4 and the lower line for IPv6. A missing line indicates the destination is unreachable. To the left of the line, the graph shows the total hop number and destination RTT. The graphs plot intermediate hops at their RTTs from the source. We map IP address of a hop to its AS number by finding the best matching prefix and origin AS in the publicly available Routeviews BGP table. There were 165,289 prefixes for IPv4 and 520 prefixes for IPv6 in the BGP table at the time of measurement. When a drop in MTU is detected, the graph marks the MTU on the right side of the hop; it suggests a likely tunnel between this hop and the previous hop. If traceroute terminated with an error, the graph marks the error code at the hop using the traceroute notations (e.g., `!X' for communication administratively prohibited). It is essential to IPv6 deployment to improve the quality and performance of the IPv6 Internet. In order to illustrate IPv6 network problems for network operators, we are developing tools to compare IPv6 measurements with corresponding IPv4 measurements. Our techniques include the dual-stack node discovery for finding dual-stack nodes, the dual-stack ping for selecting representative nodes, and scamper for detailed path analysis. Our test results indicate that we can improve IPv6 network quality by identifying and fixing a limited amount of erroneous settings. Our tools are still under development and need improvements. We plan to fully automate the measurement procedure in order to perform regular measurements and archive results. This long-term measurement strategy will provide a way to evaluate the progress of IPv6 deployment. We would also like to increase the coverage of measurement points including developing countries. Another important step is to establish procedures to notify responsible parties of problems we find using our tools. Kenjiro Cho, Matthew Luckie and Bradley Huffaker. 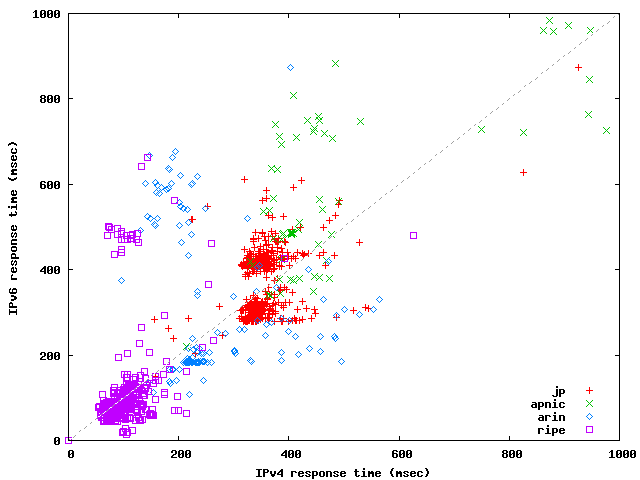 Identifying IPv6 Network Problems in the Dual-Stack World. to appear in SIGCOMM'04 Network Troubleshooting Workshop, Portland, Oregon, September 2004. (pdf). More information about scamper including the source code is available from here. This work is part of the v6fix project. This work is supported by the Ministry of Internal Affairs and Communications of Japan.